(Harasta, Syria) – The maze of roads winding through the ramshackle suburbs in what was once Damascus’s agricultural greenbelt is reminiscent of the capital’s old city; locals say any road in one particular area will often lead a traveller to the same destination as the other nearby roads. This once lush rural area, called Eastern Ghouta, has been a stronghold of the uprising against Syrian President Bashar al-Assad’s government, and consequently has been pummelled by his warplanes and artillery. Due to the fighting here, visitors must avoid the main streets and stick to the area’s narrow side roads, where it is hard to tell when you have left one town and entered another. But the pale olive trees always tell me when we have reached the edge of the town of Harasta, which lies about five kilometres from the centre of Damascus and is home to around 100,000 people. Or rather, it was home to that number of people at one time. By the end of April this year, Harasta was all but empty. The regime began its military campaign against Harasta in October 2012 after opposition fighters seized control of large swaths of the city and subsequent fighting between them and government troops forced most of the civilians to flee. Unlike the people of other towns and villages east of Damascus, they were unable to return due to the complete destruction of the city by government forces, which continue to hit the town until today. We stopped at a place where the surrounding buildings looked as if their facades had been peeled away, one layer at a time, by relentless artillery barrages. The front of one building was stripped away to reveal the internal stairs leading to a door at the top floor attached to a section of suspended steps that looked as if they had fallen out of the sky. 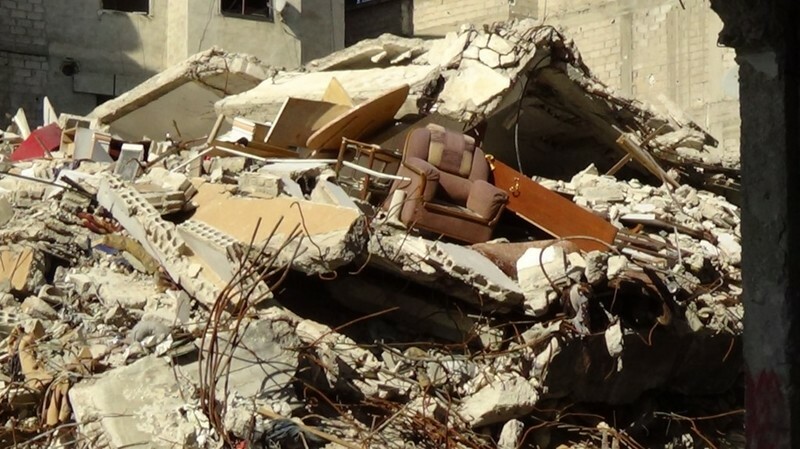 The rest of the buildings had been gutted, the furniture littering the rubble. It was impossible to recognize this place, Harasta’s main square, which anti-government demonstrators renamed Freedom Square. We gathered here to demonstrate against Assad’s government just one year ago, a place where the cry of protest echoed off the still intact buildings and the large crowd waved colourful banners. In Harasta’s Seil neighbourhood I discovered a shocking scene: an entire street reduced to nothing but collapsed roofs covering the ground and sprinkled with dozens of satellite dishes that had once topped the buildings. On the back wall of one of the balconies, someone had written the words “We will stay here” in thick black script. But the only people visible are gunmen who guard the debris and try to keep those parts of the city out of the control of the army, where some neighbourhoods still witness fierce battles. According to activists, government troops destroyed the buildings in this neighbourhood in order to widen their field of vision. The only church in Harasta survived the fighting, but has been torn apart inside. Regime soldiers have scrawled blasphemous phrases on the walls, and trashed the contents and icons. Abu Nizar, the nom de guerre of one of the opposition fighters responsible for the area surrounding the church, said he sealed the church’s warehouses to protect them from looting. Many of the neighbourhoods are plagued by terrible odours emanating from decomposing bodies trapped deep beneath the rubble, although no one knows for certain whether the source is animal or human. Battles are still raging at the entrance to Harasta, especially around a military base from which the army launches its fiercest attacks against Eastern Ghouta. I have faith the city of Harasta will continue to resist the government attacks until Assad’s forces are defeated. I feel pain for the loss of the places where I witnessed the first demonstrations and the first cheers of the revolution.